A total of 18,337 men have taken the field throughout the history of Major League Baseball (18,663 if the National Association is counted as major league, a point of contention among baseball historians). Under their “Baseball Biography Project,” the Society for American Baseball Research (SABR) has sought “to research and write comprehensive biographical articles on people who played or managed in the major leagues, or otherwise made a significant contribution to the sport.” Thus far, researchers for SABR have completed 3,591 biographies, a significant number when one considers that historians still do not know the place of birth for 72 players throughout the history of baseball. Further complicating these matters is the fact that there are 990 players who are believed to have only played in one game in their major league career, hardly giving statisticians and team record keepers time to collect information on those players. In some instances, players were taken from local semi-pro teams or local colleges and were never heard from again. Perhaps the greatest exception to this norm is the case of Moonlight Graham, who played two innings of a single game for the New York Giants on 29 June 1905. The story of Moonlight Graham was popularized by the film Field of Dreams; however, in nearly all other cases, short-stint players remain virtually unknown to researchers. Of the 990 players who played in only one game, 24 are known only by their surname, and finding career information on men named Collins, Evans, Jones, Lewis, and Smith will be difficult, if not impossible. All but one of these single-named players (a left fielder named Harrison, who joined the Senators for a single game in 1901) started and ended their careers in the nineteenth century. Another complicating factor is that many players played under more than one name over the course of their careers. Despite the challenges they face, historians have compiled comprehensive biographical records on 3,591 players, providing researchers with a useful resource for understanding the life and times of many men who played in the Major Leagues. In their most recent newsletter High and Inside, director Mark Armour noted “Overall, the project is producing more work than ever before despite a rapidly dwindling supply of well-known players.” Armour also urged younger researchers to produce information on more recent players, as many players of the most recent era do not currently have a biography. Although gathering biographical information on more than 18,000 men is daunting, especially given the hurdles that researchers must face in the process, the “Baseball Bio Project” has proven to be its own reward. Not only is the project useful to baseball historians, but it can also be helpful for genealogists who are researching an individual who had a career in Major League Baseball, whether it was one game or 3,562. While biographies are currently being written exclusively by SABR members, if you have any information on a former major league player in your family, contact the Bio Project at bioassign@sabr.org. Baseball-Reference, American and National League Encyclopedias, http://www.baseball-reference.com/leagues/. SABR, Baseball Biography Project, http://sabr.org/bioproject. Baseball-Reference, Player Biographical Information, Unknown Birth, http://www.baseball-reference.com/bio/Unknown_born.shtml. Baseball-Reference, Cups of Coffee, http://www.baseball-reference.com/friv/coffee.shtml. 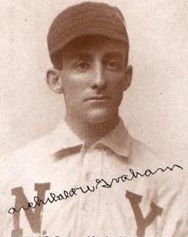 Jimmy Keenan, “Moonlight Graham,” SABR Baseball Biography Project, http://sabr.org/bioproj/person/a054b3d6. Mark Armour, “From the Director,” High and Inside 1: 3 [February 2016]. Baseball-Reference, “Career Games Played,” http://www.baseball-reference.com/leaders/G_career.shtml. Pete Rose leads the major leagues with 3,562 games played. I hope they are they intending to include the women in the Baseball Hall of Fame. My 2nd great aunt Amanda Clement was one of the first 3 inducted..